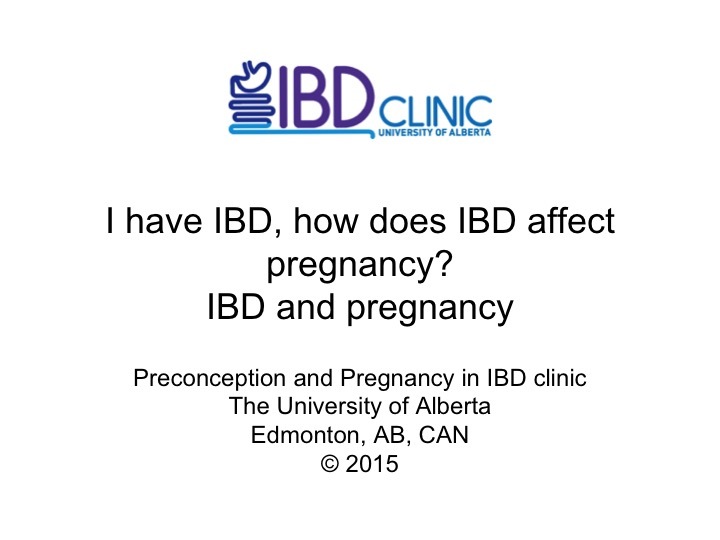 I have IBD, how does IBD affect pregnancy? 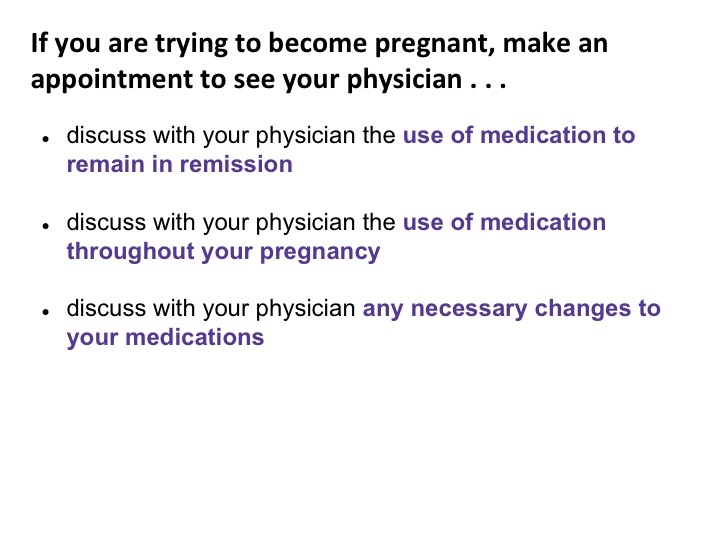 IBD medications and pregnancy? IBD onset typically occurs during the reproductive years. Therefore, women and their families often have concerns regarding how IBD and IBD medications affect their pregnancy and offspring. Many women with IBD who wish to have children are often on medications that may need to be adjusted. Zelinkova (2010) conducted a study on IBD patients with active plans for conception and found that a large proportion of patients are taking IBD medications, especially immunosuppressants1. IBD is associated with a slight increased risk of preterm delivery, small for gestational age infants, and miscarriages or spontaneous abortions compared to the general population2,3. These risks are increased even more in women who have active IBD. 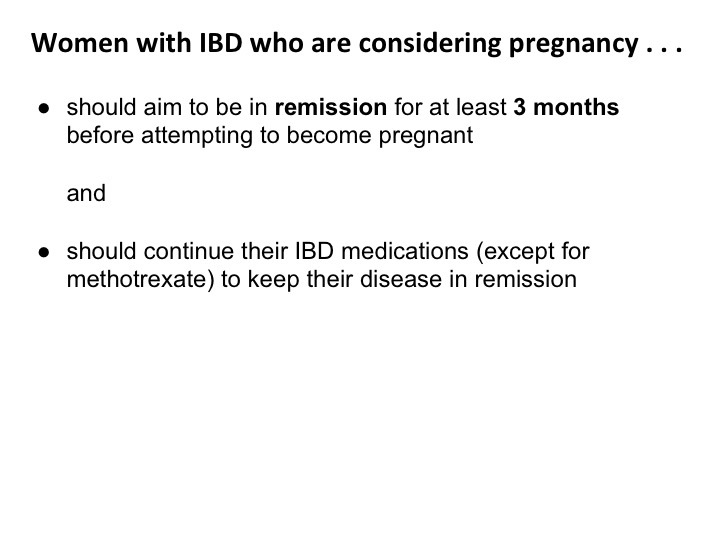 Women with IBD should aim to be in remission before attempting to become pregnant. 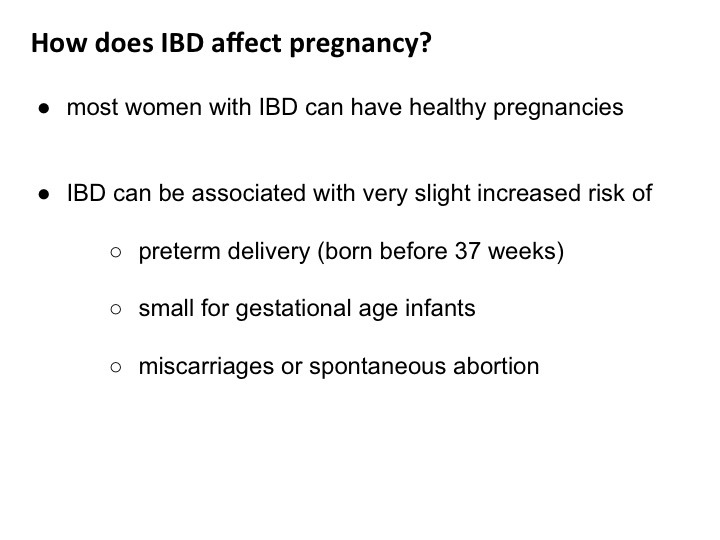 Women who had active IBD within 3 months of conception are at risk of having active disease during pregnancy4. On the other hand, women who were in remission at time of conception will be more likely to stay in remission during pregnancy. They should continue the IBD medications that they need to stay in remission (the exception being methotrexate, which should be stopped 6 months prior to conception). 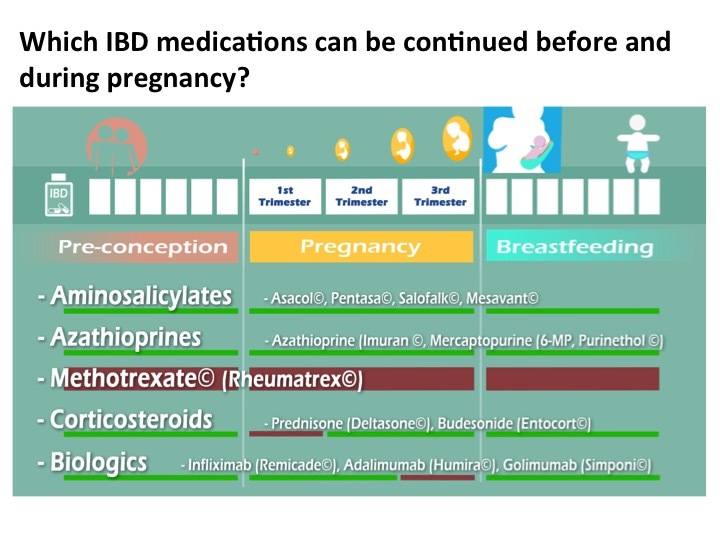 Which IBD medications can be continued before and during pregnancy? Most IBD medications are safe for use while trying to conceive and to continue during pregnancy but certain medications may need to be adjusted. 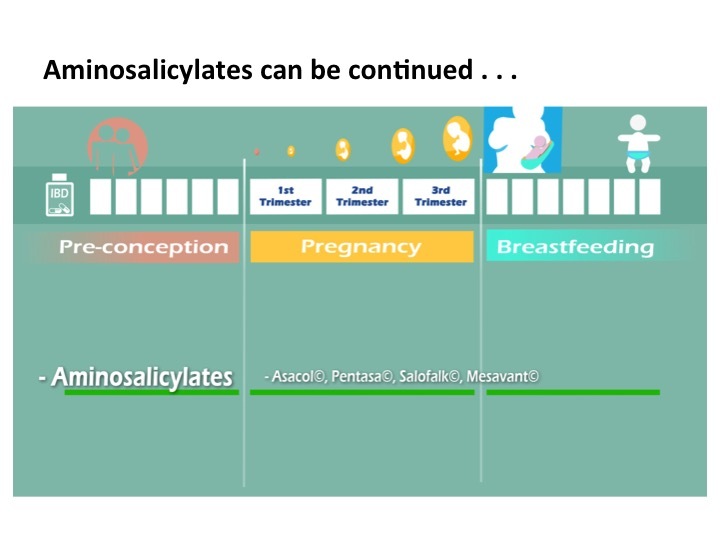 Aminosalicylates: Most formulations of 5-ASA are considered safe to continue into pregnancy5. Studies have found no significant association between 5-ASA drugs and poor pregnancy outcomes6. The coating of one 5-ASA medication (Asacol ©) contains dibutyl phthalate (DBP) which has been associated with abnormal development in animal models. However, there has been no significant findings among humans5,7,8. Sulfasalazine (Salazopyrin©) is considered safe to use before and during pregnancy7. However, since sulfasalazine inhibits folate synthesis, women taking this medication should also be taking folic acid supplements5,7. Men taking sulfasalazine should be switched to another oral mesalamine because sulfasalazine has been associated with oligospermia (low sperm concentration)9. 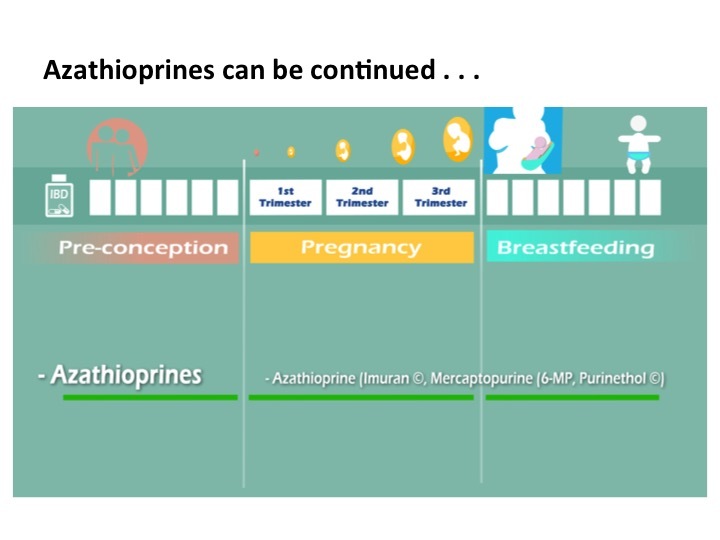 Thiopurines: Azathioprine (Imuran©) and 6-mercaptopurine (6-MP) (Purinethol©) can be continued during preconception and during pregnancy if needed for maintenance therapy. Although studies have reported abnormalities in animal models, and older studies reported some risk of adverse outcomes among pregnant women taking these medications, recent larger studies on women with IBD taking thiopurines suggest no significant adverse outcomes10-12. 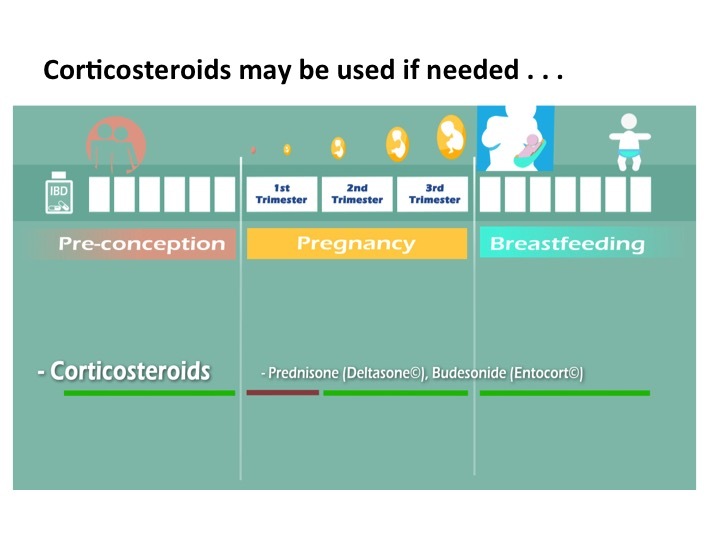 Corticosteroids: Steroids, such as budesonide (Entocort©) and prednisone (Deltasone©) can be used to treat active IBD before and during pregnancy13. However, there is a small risk of cleft palate in neonates exposed to corticosteroids in the first trimester14,15. Biologics (anti-TNF): Adalimumab (Humira©), infliximab (Remicade©), and simponi (Golimumab©) are considered safe to continue into pregnancy. However, studies have shown that these proteins cross the placenta to the neonate after 22 weeks of gestation. Therefore, physicians often administer the last dose of biologics before the third trimester, to minimize fetal exposure to the medication. 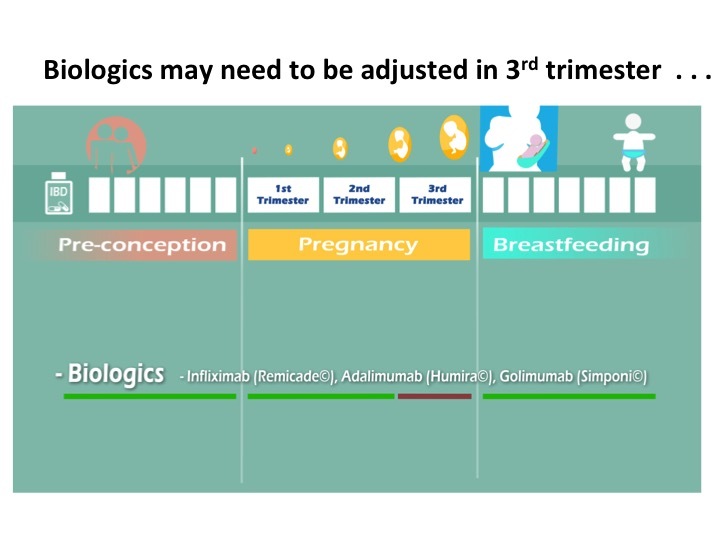 However, women with IBD who require biologic anti-TNF therapy during pregnancy may continue the medications if the risks of having uncontrolled IBD outweigh the risks of fetal exposure5,7,11,12,16. Biologics (anti-alpha4/beta7 integrin): Vedolizumab (Entyvio©) is considered safe to continue into pregnancy, although has the least data in use in pregnancy as it is the first IBD gut specific drug on the market17. To minimize exposure to the fetus, timing of the dosing is approached in similar fashion as the anti-TNF agents. Biologics (anti-IL12/23 p40): Ustekinumab (Stelara©) is considered safe to continue into pregnancy, based on the limited available information from clinical trials observations, and clinical experience18. There are longer term safety data from the psoriasis PSOLAR registry. To minimize exposure to the fetus, timing of the dosing is approached in similar fashion as the anti-TNF agents. Methotrexate (Rheumatrex©) is contraindicated to use in women who are trying to become and during pregnancy5,7. 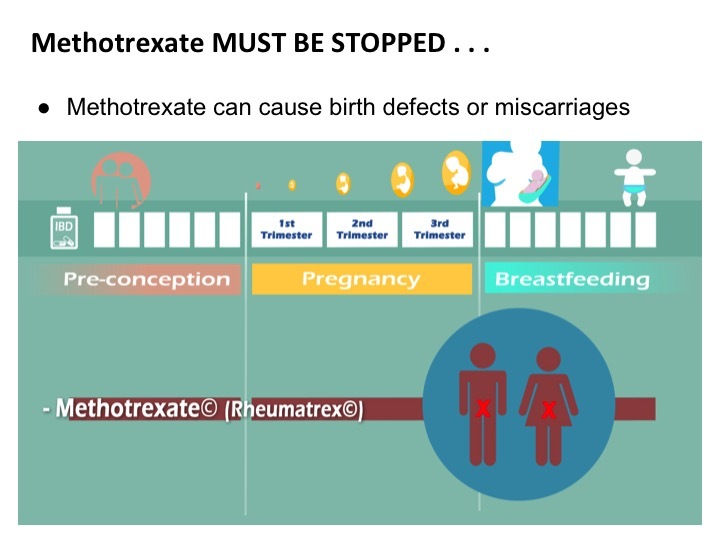 Methotrexate can cause malformation of an embryo) and can cause fetal death.14 Furthermore, because it can remain in the body for an extended time period, physicians recommend that both men and women with IBD who are on Methotrexate discontinue use for 3 to 6 months prior to trying to conceive15. Small Molecule (JAK inhibitor): Tofactinib (Xeljanz©) is contraindicated for use preconception and in pregnancy due to tetratogenic effects noted in animal pre-clinical studies, and limited evidence of safety in use in humans. Zelinkova Z et al. Reproductive wish represents an important factor inﬂuencing therapeutic strategy in inﬂammatory bowel diseases. Scand J Gastro. 2010; 45:46–50. Getahund D et al. Association between maternal inflammatory bowel disease and adverse perinatal outcomes. J Perinatol. 2014 June; 34(6):435-440. doi: 10.1038/jp.2014.41. Oron G et al. 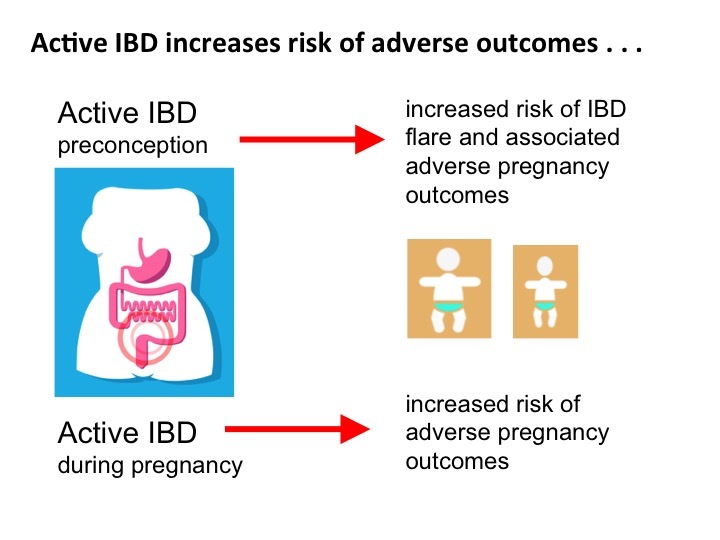 Inflammatory bowel disease: risk factors for adverse pregnancy outcomes and the impact of maternal weight gain. J Matern Fetal Neonatal Med. 2012;25:2256-2260. Biedermann L et al. 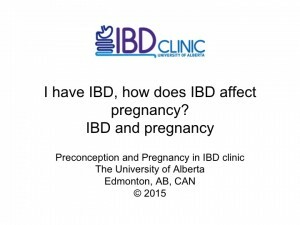 Pregnancy and Breastfeeding in Inflammatory Bowel Disease. Digestion. 2012;86:45-54. Rahimi R et al. Pregnancy outcomes in women with inflammatory bowel disease following exposure to 5-aminosalicylic acid drugs: A meta-analysis. Reproductive Toxicology. 2008;25:271-275. Ng S W &Mahadevan U. Management of inflammatory bowel disease in pregnancy. Expert Rev ClinImmunol. 2013;9(2):161-174. Asacol (mesalamine), package insert. Warner Chilcott Pharmaceuticals Inc. OH, USA (2010). Shim L et al. 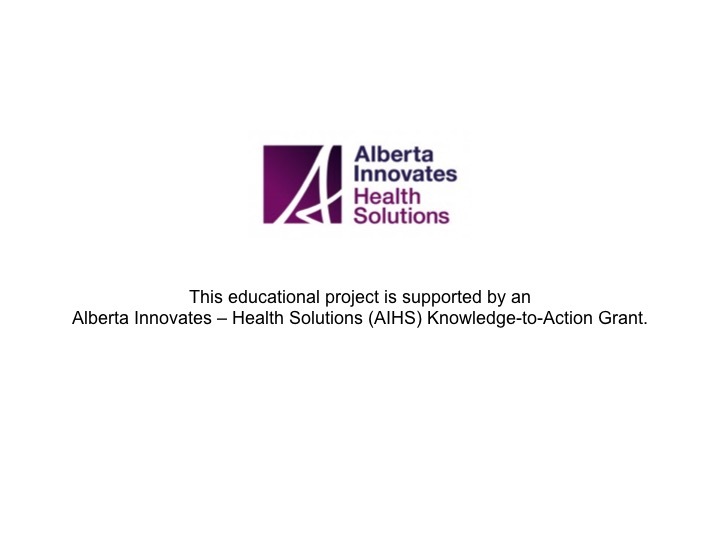 The effects of azathioprine on birth outcomes in women with inflammatory bowel disease (IBD). J Crohns Colitis. 2011;5:234-238. Saha S & Wald A. Safety and efficacy of immunomodulators and biologics during pregnancy and lactation for the treatment of inflammatory bowel disease. Expert Opin. Drug Saf. 2012;11(6):947-957. Casanova M J et al. Safety of thiopurines and anti-TNFα drugs during pregnancy in patients with inflammatory bowel disease. Am J Gastroenterol. 2013;108:433-440. Neilsen O H, Maxwell C, & Hendel J. IBD medications during pregnancy and lactation. Nat Rev Gastroenterol Hepatol. 2014;11:116-127. Van der Woude C J et al. European evidence-based consensus on reproduction in inflammatory bowel disease. J Crohns Colitis. 2010;4:493-510. Mahadevan U, Vermeire S, Lasch K, et al. Vedolizumab exposure in pregnancy: outcomes from clinical studies in inflammatory bowel disease. Aliment Pharmacol Ther 2017;45:941-950.